While playing the game Last Word, players attempt to beat the random interval timer and all the other players to the finish line by connecting subjects and letters. 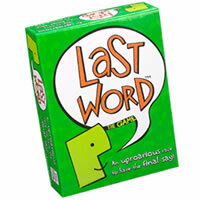 Last Word is a great game for two to eight adults and doesn't take too long to play. Learn more about the party game Last Word and don't forget to check out the game rules and instructions. Winning multiple awards, this game is sure to not disappoint its players with the lack of fun and excitement. Give Last Word a try and let us know how you like this game in our comment section. You need to be the first player to get to the final square while trying to connect subjects and letters. To win you'll also find need to find a way to beat the random interval timer and other players. Last Word comes with a board game, card stacking board, 230 subject cards, 56 letter cards, 8 colored game pawns and colored trade-in pieces, an electronic random interval timer and the Last Word game rules and instructions. Please keep in mind that the official Last Word party rules and instructions could be different depending on the game version you have. The rules below are some of the exact directions on how to play Last Word. Share with us your comments, funny stories, tips, advice, strategies, creative ways to play, questions about how to play, problems with the rules or anything you want about Last Word. All submissions will be reviewed within 24 hours. Click here to add your Last Word comments. Odd, I was sure I'd left a comment here.Anyway, I reemmber seeing these when I was a kid, but never bothered to get them-- any money I had which might have gone towards them seemed better spent on more NES games, or Ninja Turtles figures, or other stuff in general.Still, I'm glad to see what I missed out on at the time. Truth be told, I'd like a copy of the Super Mario Bros. one, if only because it has "official" art of Peach in the same colors as the original game, before she went "all pink, all the time."